Pyrolysis process is conducted in dedicated heating equipment. It has 2 main areas where 2 stages of the process are carried out. The pyrolysis is divided to radiation and convection. The pyrolysis itself is conducted in radiant part of the equipment, dehydration, final decomposition and condensation is carried out in convection part. Depending on feedstock composition pyrolysis plants differ in their radiant part. For the processing of oil products the coils (tube chamber) are used, for solid waste treatment the open reactors can be used. Differences in design are reflected in the heating system that requires controlled increasing of the temperature in reaction zone. The design also must ensure the shortest possible feedstock exposure to the heat that must not exceed 0,1-0,5 sec. Today our modern development of waste recycling technologies emerged on number of thermal pyrolysis or thermal decomposition plants, which are fully automated and easy in maintenance, for example, Batch Thermal Decomposition Plant (UTD-1). Dry residue rests in the chamber and is removed after cooling. The main equipment is: reactor, heat exchanger, separator and tanks. Cooling is carried out by water and air cooling system, the burner uses both liquid fuel and gas. Distilled water (in case of brine based drilling sludge) is used locally. 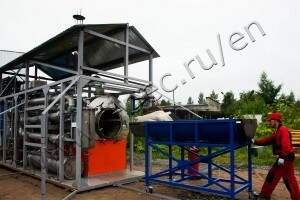 Cost – efficient process for drilling waste, scrap plastics and resin-based products.